Will you survive the fickle desires of the Gods and the cruel twists of fate that await you? Recover the Golden Fleece, and your legend will live eternally in Argonauts - a cooperative game by Alcyon Creative. 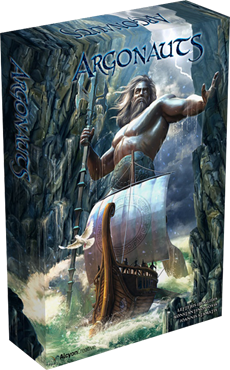 Argonauts is a cooperative game for 1-4 players, where even the best laid plan can fall victim to the wrath of the Gods. Tasked with a suicidal mission by the usurper King Pelias, Jason and the Argonauts must acquire the Golden Fleece and return it safely to Iolkos without losing the Argo or too many members of her crew. Alcyon Creative launched Kickstarter project for the game only a couple of days ago and it's already funded, so check it out!